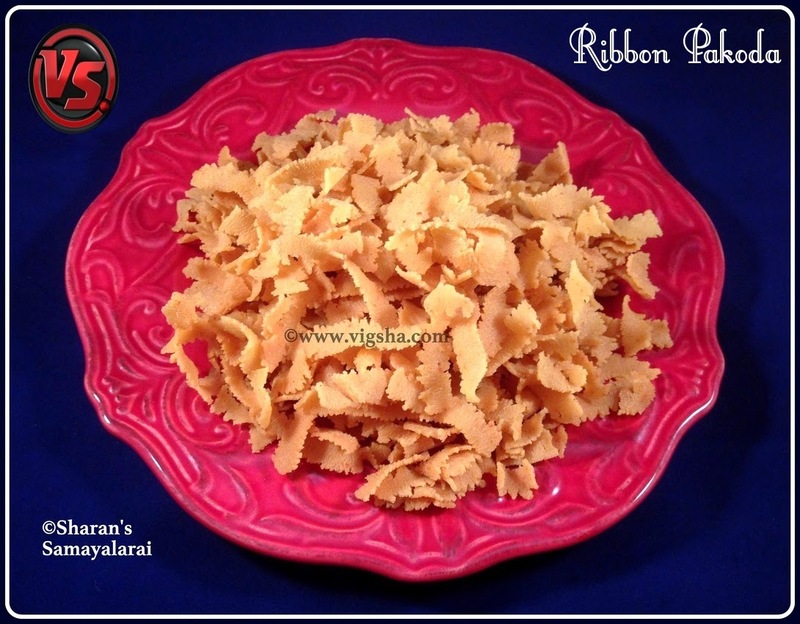 Ribbon Pakoda is a popular South-Indian festival snack which is a quick and tasty dish. I prepared this for diwali (2013) and somehow I didn't get a chance to post. As Krishna Jayanthi is nearing, I decided to post this now.. This is my mom's recipe and it was my first attempt of making this Ola Murukku. Mom usually follows the elaborate method by grinding the rice. But this time she taught me this shortcut method. Taste was equally good. 1). Powder the fried gram dal and sieve it along with rice flour. Microwave the butter for 30 seconds to melt. Keep aside. 2). In a mixing bowl, mix the rice flour, besan, fried gram dal powder, garlic powder, chilli powder and salt. Then add softened butter and combine well. Make a stiff and non-sticky dough by adding water little by little. 3). Heat oil in a wide and deep pan for deep frying. Use long slit disc (ribbon pakoda plate) and grease the murukku press with oil. Once the oil is heated, fill the murukku press with the prepared dough till 3/4th and carefully press directly in oil in circular motion. 4). Fry in medium heat until they turn golden brown and the bubbles subsides. Then turn over and let it cook until the bubble ceases. Remove them using a long slotted handle and drain in a tissue paper. Repeat same for rest of dough, keep the dough covered till you use it. Once it is cooled completely, store in an airtight container. # Do not over-lap the pokoda. One layer is good to ensure even and quick cooking. Also make sure the flame is in medium. # You can also use besan instead of fried gram dal powder. # You can use hot oil instead of butter. But do not avoid as the murukku becomes very hard. # You can also use freshly ground pepper powder instead of red chilli powder. This way, pakoda will be white in color. # Garlic powder adds flavor to the murukku. If you do not have it, make a fine paste and add it to the dough.